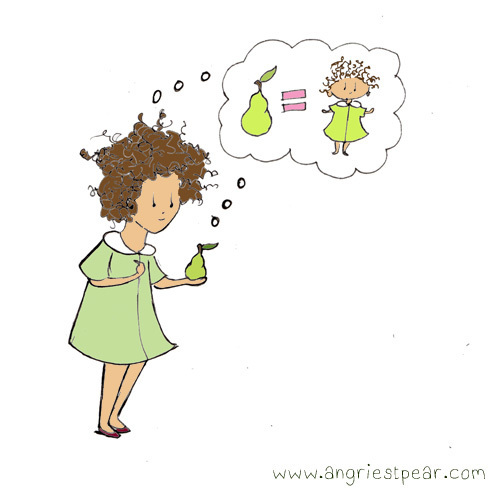 Angry Pear is about pears– their troubles, their joys, and their anger. Angry Pear is a recurring character who is angered by everything and everyone. Can she really be blamed? The strip originally began as a characterization of my own life. I coined the word “pearish” among friends and family as a way of describing peevish, fickle, and often silly behavior. Drew McKevitt is a knitter and illustrator of pears. This blog’s intention is to show pears in their natural habitat and showcase their pearishness. You can find / follow me and Angry Pear on Facebook and Twitter. Also check out the Angry Pear Etsy shop! Hi, Drew! I love your drawings. They’re entertaining and yet oddly relaxing at the same time. The pears — even the disgruntled ones — are all so endearing. Thank you so much for your nice comment and subscribing. Your Amaretto Pear Baked Oatmeal looks delightful by the way. I like the new heading caption – Another day, another pear! I’ve been reading Angry Pear for a while now, and I want you to know that I love how consistently you make me smile. There’s a lot about this gentle, strangely perverse, very sweet comic to like. I’m all admiring and stuff. Thank you so much! That means a lot to me. I’m glad you are enjoying the blog (I really like drawing these pears). Thanks! I’m glad you like them. Pear is a lovely nickname! I just found your blog through “Freshly Pressed”…It is so lovely ! The pears are all so cute 🙂 For a pear , they show a lot of emotions 🙂 what a great concept ! Thank you so much! I’m glad you enjoy it. Thanks. I really like your blog as well! Great work! Loving this! Congrats on being Fresh-pressed! I’m so happy you were finally Freshly Pressed. You absolutely deserve it! This calls for a glass of pear wine! Thanks so much! I am absolutely having a glass of wine this evening– just as soon as I get done with work! are there other angry fruit? Thanks. No only pears. Other fruits are not as fun or interesting. I love your Angry Pear character, Drew! She’s quite wonderful! Love it! Great idea, and so refreshing- just like a pear! haha. Yes. I am definitely a pear! Thanks so much for visiting! Freshly Pressed has been great for pears. I’m so glad you got Pressed or else I wouldn’t have discovered this blog. These are fabulous! I have a cartoon I can’t share because it’s under a different name I don’t want associated, but it has a similar concept: simple images, simple colors, simple props. Done right like this, you can apply them to almost anything can’t you? Great work!! Your pears truly exhibit what life is all about! Thanks for creating them! Keep up the great work! Thanks! I really enjoy making them, so it’s nice to know people enjoy seeing them! Very nice blog and very different than most of the blogs that I find. 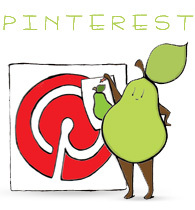 Who would of known that a blog that is all about pears would be so entertaining? This is a really amusing site, and I’ll be sure to come back often to see what the Pears are up to now. PS: I really like the illustrations too. Thank you! Pears look very unassuming at the market or in fruit salads, but they lead very interesting lives! I like your site as well. Thank you very much. Thanks for visiting! So glad your blog was freshly pressed. I love it! cool blog you got here!…my sister teases me and calls me a pear. your blog just make me feel ‘not teased ‘ anymore.!!! lol. im liking it! hahahaha, thanks. Actually my grandmother and I used to call each other pears to tease one another. Eventually, it became a term of endearment (as it should be). Yes, your pears are very inspiring and couldnt help smiling myself. Thank you so much. I am glad you enjoy! I simply love these pears. Had no idea pears could be so uplifting, even though they are angry. Thanks so much! I’ll try to add you! Hmmm. It did not work for me either. Perhaps you can subscribe to the RSS feed? Thank you so much! What a great surprised. I’m honored. Subscribing 🙂 This is great stuff. One day, I will be more disciplined with doodling to include more comics on my own blog! Thanks so much! I really enjoy those pictures on your blog. All my son likes to eat are pears. And mangoes, but mostly just pears. I don’t know how Angry Pear feels about blogging awards but I really love this blog and I just wanted to stop in and say congratulations I’d like to pass on The Only Lovely Blog Award to you. I’ve written a post about it and I hope you’re happy with the link I’ve put to your blog. You can find it here. Thank you so much! Sorry it took me so long to get this. That’s very kind of you. It means a lot to me that you enjoy Angry Pear so much! Thank you so much! 🙂 I am honored! http://insanityofmotherhood.com/2012/05/19/one-lovely-blog-award/ Hello. I have nominated you for the One Lovely Blog Award. Congratulations! I really love your illustrations…. and pears…of course!!!! ahahahah! Congrats for being in the Middlest Sisters 50. Love your idea and the execution is wonderful. Wish I could draw! Nice! Pears pair so well with…pretty much anything. Like my walls. Do you ever sell any of your illustrations? Thanks so much! I actually don’t sell prints right now. I’ve been working on it for a while, but I have trouble with getting the colors just right– hopefully I can make them available in the near future. However, if the pear you are interested in is in black and white, I can definitely make you a print of that. Just contact me by email (angriest[dot]pear[at]gmail[dot]com or on etsy. http://www.etsy.com/shop/AngryPear . Thank you for visiting my blog! I can completely relate to your love of pears. I have the same fascination and they are all over my house as well it’s always wonderful to hear from someone who appreciates (appearciates) pears as much as I do! I hope the knit pear turns out well! I am working on posting a pattern and / or offering them in my etsy shop soon. Thank you so much! I’m glad you like the pears! Hi Drew, I love your blog. If I had seen this before doing my little rant, I would have put in a link. Lovely illustrations. Thank you! I really enjoyed your rant. Pears and anger go surprisingly well together. Hi Sarah, thank you for visiting angry pear! Hahaha. Thank you so much! Thank you so much! I really enjoy drawing these pears, so I’m always glad to hear when someone else gets and apPEARciates it! Thank you for the like on my blog. Very cute pieces you got here! Thank you very much. And thanks for checking out my comic. Drew, I’ve nominated you for the “Super Sweet Blogger” Award. To see the nomination, visit http://anotherlovelyday.wordpress.com/2012/12/17/super-sweet/. Ooo! Thank you so much! Aww. Thanks! I pear you too. As I love your blog, I have nominated you for a Sunshine Award! You can find details here http://talesfromateapot.wordpress.com/2013/05/19/sunshine-award/. Thank you so much! That’s lovely! Can I tell you how much I adore the new link pics for FB, Twitter and the shop? Genius! You noticed! Thank you so much! I debated about them for ages. Thanks so much! I’m always happy to hear that! Glad you are following! I needed a daily dose of laughter in my life. I mean who doesn’t? Thank you for following illustrated moment! I couldn’t help but laugh at your ‘rabbit poo’ post, as I feel your pain. I have a blue mini lop who basically owns the house…and I’ve just become a mere slave too. Haha. Those buns really take over! They are so deceptively cute and small, but really they long to rule! Found your blog off Peas and Cougars blog list… glad I did!! I too am a lover of fruit and lover of pears… I’ve heard that pears can help woman keep weight off… not so sure if this is true… but they are yummy! I look forward to reading more post… thanks for the laughs!! will you be making christmas cards this year? I would love to give them out this year!!! (I’m a caregiver and my resident had a christmas card from a Pear who got tangled in lights)!! !